Daisy Spalton was born on 12th May 1910; just a few months before the pioneering nurse Florence Nightingale died, the new aircraft factory at Filton was building its first aircraft, the Boxkite, and a year before the launch of the ill-fated ocean liner RMS Titanic. This is the first 100th birthday celebration for Wendy Cole who joined the Court as its Manager last month. She said: "The last centenary was celebrated here about 18 months ago and I am sure this one won’t be the last. Our residents have a wide range of ages which makes it all the more interesting for them when they meet and share experiences and reminiscences. One of our residents who unfortunately died not long ago flew Spitfires during the war." The Court is part of the Blanchworth Care Homes Group which runs 14 other similar homes across the country from its Head Office at Blanchworth near Dursley. It has accommodation for up to 11 elderly people in need of 24 hour long and short term residential care although at the moment only seven of its rooms are occupied. Wendy added: "We currently have vacancies for four more residents at the moment which gives us plenty of opportunities for more occasions like this in the future. Daisy has lived here for nine years which is longer than any of the others so maybe her birthday is a testament to how well we look after our residents!" Daisy, whose husband passed away shortly before she moved into the Court, is a little taken aback by the whole thing. 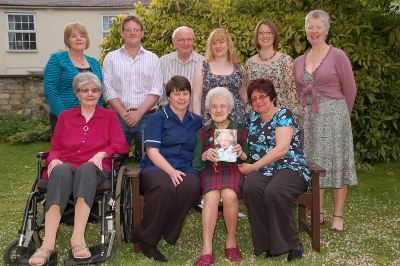 She said: "I never expected to make it to 100 as neither of my parents managed anywhere near it. I seem to be a lot healthier now as I was prone to quite a few illnesses when I was younger. I am happy here. They look after me well and it’s nice to meet and chat with the other residents at meal times." And her secret to a long life? Daisy reckons it is down to hard work. She said: "I used to be a seamstress which kept me very busy until recent years. Now my hands and eyes aren’t what they used to be."